Aimed at discerning enthusiasts, the diminutive Leica C size boasts a stabilized 28-200mm equivalent f2.0-5.9 zoom, 12-Mpix 1/1.7in type back-illuminated MOS sensor and built-in 200k-dot EVF. Read on to find out how this camera performs. 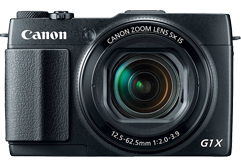 Canon's PowerShot G1 X Mark II is an intriguing update. It keeps the 1.5"-type sensor from its predecessor, but adds a faster processor, longer and brighter lens, tilting LCD, dual control rings and has Wi-Fi with NFC. The big change for 2014 is no more optical viewfinder (though an EVF is optional). Our first impressions review covers the usual aspects of the camera (Controls, Body and Design, etc. ), but also has our Shooting Experience report where we talk about it handles in the real-world.